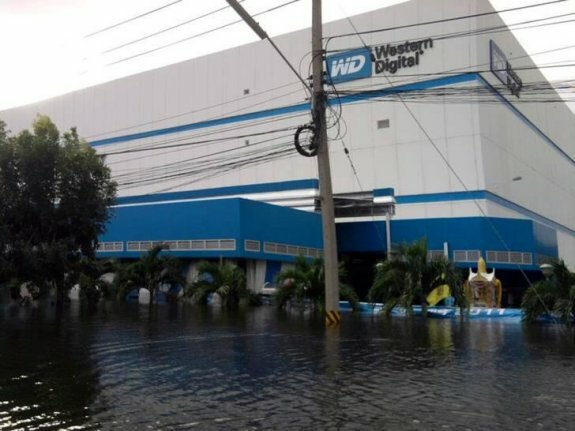 Bright Side of News got its hands on pictures of Western Digital's factory in Bang Pa-In, near Bangkok in Thailand. Close to 60 percent of all WD HDDs are made at this location, so when viewing the pictures with 1m to 1.4m deep water levels it shouldn't come as a surprise that HDD prices are skyrocketing. You can view all the photos over here. The site also mentions the digital camera industry was hit pretty hard as well, just as the car industry as component manufacturing for Honda, Ford, Isuzu, Mazda, Mitsubishi, Nissan and Toyota are all hit hard. Western Digital is not the only company affected by the floods, as several major component manufacturers had the facilities in the area. Worldwide effect is expected at no less than 28% of quarter-on-quarter drop in Hard Disc Drive (HDD) production, affecting all major players. Hard drive industry is not the only one, as digital camera industry was hit hard: Canon, Nikon, Sony are all hit in double digits, and you can expect prices of digital cameras to go wild as well.